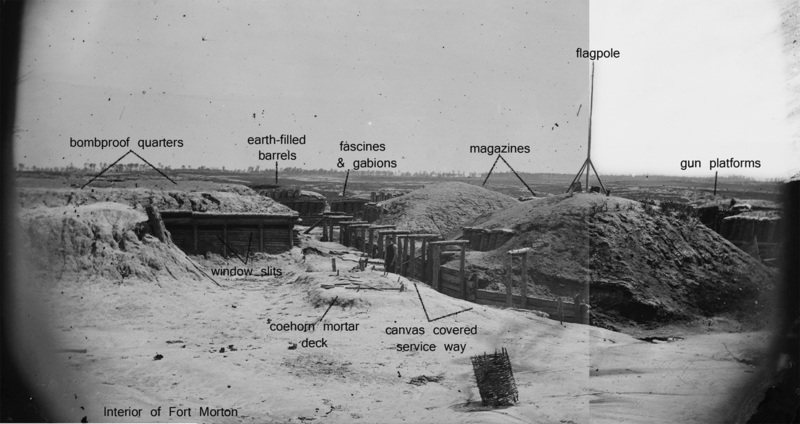 Fort Morton evolved into an enclosed fort from a 14-gun battery built on the Taylor Farm opposite Confederate Elliott's Salient. From here, on July 30, 1864, Maj. Gen. Ambrose Burnside and his staff observed the explosion of the Mine beneath Pegram's Battery and the failure of the subsequent attack. 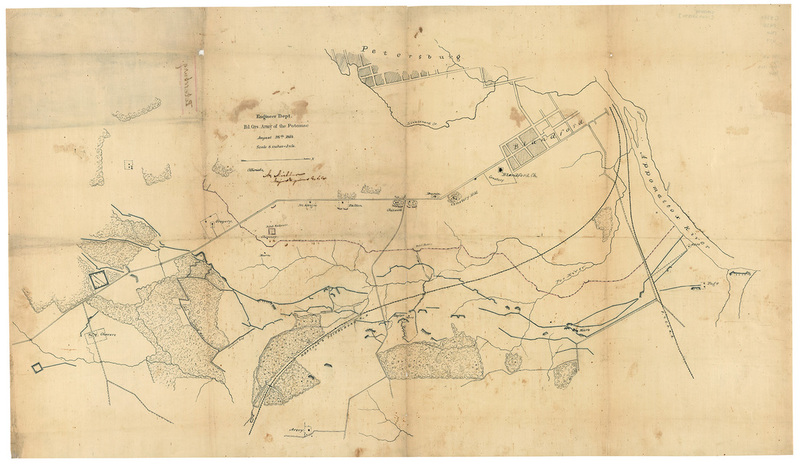 Mash-up of "Field Battery" (Military Atlas Plate 107:3) and Engineers Plan of Fort Morton (RG77 Dr. 150-18) by Philip Shiman. Detail from the above map showing the 14-Gun Battery at the Taylor House, which was afterwards redesigned as Fort Morton. An expansive view into Fort Morton from near Battery XVI (LC-B811- 1070), unattributed photograph by Timothy O'Sullivan. Baxter Road can be seen crossing the center of this image. An opening was made in the substantial parapet to allow Federals to pursue the evacuating Confederate army. This detail demonstrates the substantial changes made to the Federal siegeworks in the fall of 1864. The open 14-gun battery on the left was conceived merely as a gun platform to concentrate and deliver artillery fire. 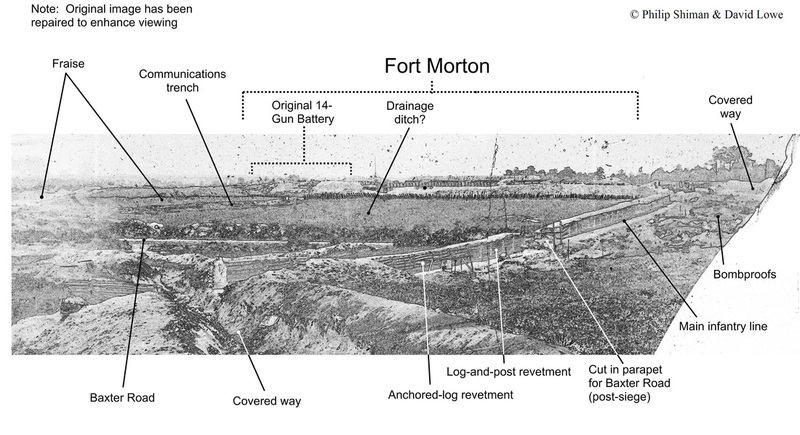 Enclosed for all around defense, Fort Morton occupied and dominated the ground. As far as the Confederates were concerned, Morton was invincible. Federal engineering at its finest. View of Fort Morton from Confederate Battery 25 (LC-B811- 3219). This unattributed stereograph (LC-B815- 1054) is captioned "Petersburg, Virginia. Earthworks in front of Petersburg." 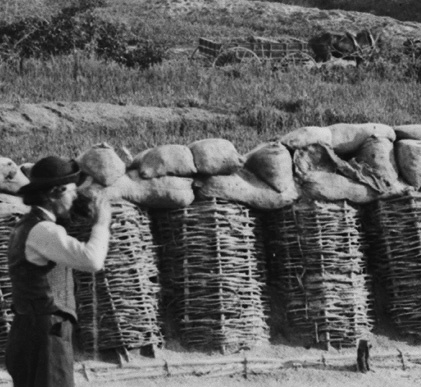 It was taken by Timothy O'Sullivan from the northern wall of Fort Morton, looking south by west. O'Sullivan and his assistant made at least two exposures of the interior of Fort Morton -- LC-B815- 1054 (00517 above) and LC-B815- 1055 (00518 below) as shown on the detail here. Three images were taken at Battery XV looking south and one near Battery XVI looking north. These constitute the Baxter Road series. The photographers' wagon was largely limited to passable roads. The camera positions needed to be within a close distance of the wagon. Detail from LC-B815- 1055 (00518), showing a supply wagon, likely part of the photographers party, parked in Baxter Road. This unattributed stereograph (LC-B815- 1055) captioned "Petersburg, Virginia. 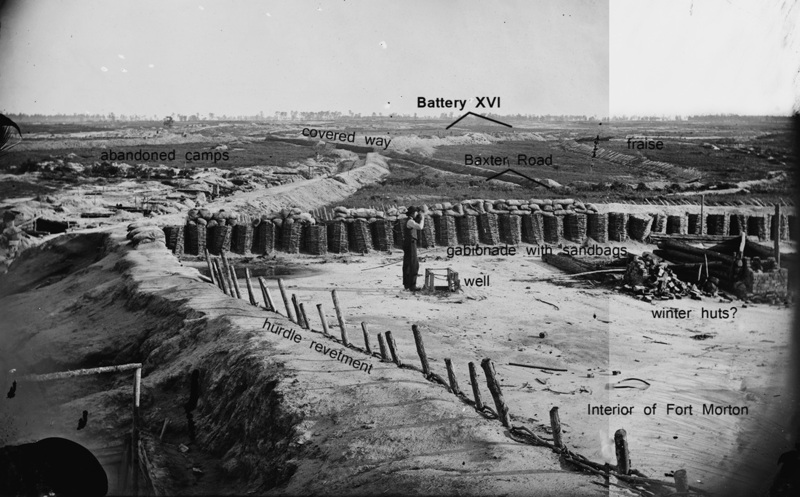 Earthworks in front of Petersburg" was taken by O'Sullivan's assistant from the rear wall of Fort Morton at the sally port. O'Sullivan is drinking from a tin cup at the well.